Thanksgiving is just a few days away and it seems only natural that our thoughts turn to the many blessings we have to be thankful for. My mind goes to the usual things, my loving husband, my wonderful family, our goofy dog, our home, our health, our food, our freedom, and of course the love of our Savior. This year I have another to add to my list. I am currently going through Fr. Michael Gaitley’s 33 Days to Morning Glory retreat in preparation for consecration to Jesus through Mary on the Feast of the Immaculate Conception. When I first began the retreat, I will admit I was a little nervous. I love Mary but wanted to make sure that this consecration would lead me ultimately not to her alone, but to Christ. While parts of the readings have taken some prayer and contemplation to better grasp, they have opened my eyes and my heart to Mary’s presence in my life in a new way. Looking back at my childhood it seems that there was no escaping the love of Mother Mary. 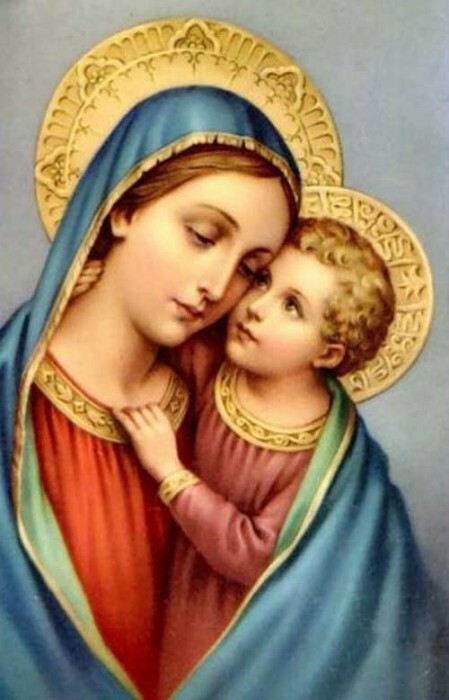 We were taught the Hail Mary and the Rosary, we had beautiful holy cards and statues of the Blessed Mother as reminders of her perfect example, we watched animated children’s videos of Mary appearing in Fatima and in Lourdes. Even the parish I grew up in, Immaculate Conception was named in honor of Mary. The importance of Mary in our faith was never lost on me as I grew up. It was so instilled in me that I took it for granted and failed to realize what an enormous blessing it is to be able to walk this journey of faith with Mary by our side. When I think back again to that list of things I am thankful for, I can see Mary working within each one. When I met my husband it was not long before I knew he was the one I was meant to be with. But before I could make that decision, I remember praying deeply for guidance. I prayed for God to show me if this was truly the man He had meant for me. And I prayed for Mother Mary to guide me to be the wife God had called me to be. On our wedding day, amidst the flurry of activities and emotions, I remember going over to the statue of the Blessed Mother during Mass to offer flowers up to Our Lady and take a moment to pray for her guidance in our marriage. Yes Mary was certainly present in bringing my husband and I together and she has been there guiding us in our love for each other and for the Lord ever since. As I mentioned before, devotion to Mary was instilled in my sisters and I from an early age. Our parents and grandparents showed us just how important she is in our lives. And I strongly believe that the faith we learned as children formed the foundation not only for the faith that we share today, but for the deep relationships I share with my family even now that we are grown and scattered across the country. My goofy little puggle. You might be wondering how in the world Mary’s presence in my life relates to my dog. I believe that I am called to care for a family. I have spent countless hours in prayer for that to happen. But God’s ways are not my own and He has a perfect plan for us to one day have a child. In the meantime, my motherly energy goes toward my pup. And in the morning, when I say my Rosary and my little dog curls up next to me quiet as can be as if she knows this is prayer time, I know that Mary is there bringing me to God and helping me to be patient and enjoy the time with my little puggle while I wait for the blessing of a baby. Our home, health, food, freedom…Mary is there in all of it. Through times of job searching, apartment searching, doctor’s appointments, Mary is there. Even if we do not always see it, she is there nudging us closer to God as we face each decision in life. There showing us the deep love of the Father as we see the blessings He has poured out for us. Mary’s yes to being the mother of Our Lord showed us the way in which we are all called to respond to the Lord. She accepted the will of the Lord without knowing exactly how it would all play out. She placed her trust fully in God as she raised the child Jesus. She was with Him as a baby, as a child, as a man. She was there for His miracles, for His joys, for His suffering. She stood by His side through it all, even at the foot of the cross. The love she has for Jesus is deep and pure. And it is that love that she wants to share with us. To show us how to love the Lord more perfectly. Mary’s presence in our lives is a wondrous mystery that is truly something to be thankful for. To have the mother of our Lord guiding us every step of the way so that we may become more of the people God has called us to be is such a blessing. As we take a special moment to thank the Lord for all that we have, let us remember to thank Him for the blessing of His Blessed Mother Mary who leads us to a deeper love for Christ our Lord.